Ms. Obama is referring to the mass abduction of girls from their school in Nigeria. 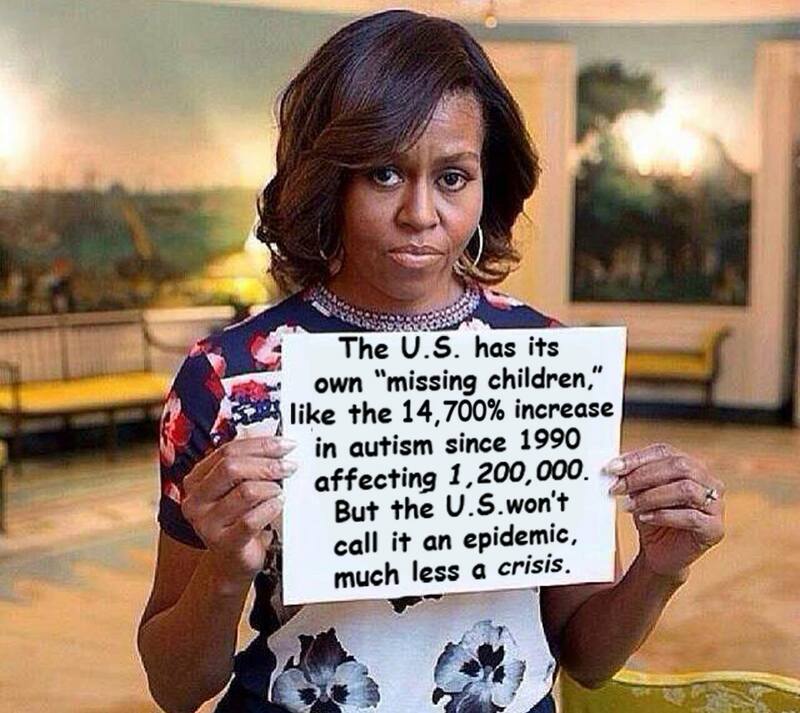 Yes, the faux autism advocates decided to try to get some attention for themselves using Ms. Obama’s picture. In case you are wondering, yes I mean attention for themselves. 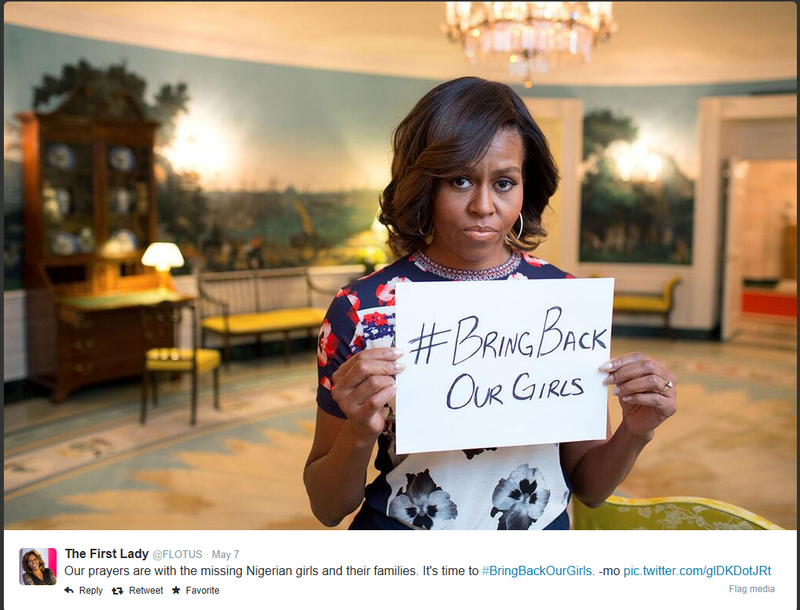 Consider the statement Ms. Obama publicized: “Bring Back Our Girls”. Simple. Direct. Calls for action. Now consider the statement by the faux autism advocates. Long and doesn’t actually call for real action. Read it again if you missed that. All the action they call for is to call autism an epidemic and a crisis. They are calling for someone to accept their views on autism. They didn’t take the opportunity to say, oh, “We need more support”. “We have 1.2M people with great needs”. No. They called for attention for themselves and their agenda. And they did it in a way that reflects very poorly (to be polite) on the autism communities. I work with children who have Autism. I don’t know what to get mad at first. The photoshopping? The callous comparison? The horrible idea that children with a genetic disability are “missing”? The inability to understand what the word epidemic means? Revolting. The very fact you think it needs to be cured is disgusting! Of the three autistic children I know, two are unvaccinated and they are siblings…this makes me think that autism is genetic and absolutely NOT caused by vaccines. This is a really gross way to push your agenda…photo shopping a pic of the First Lady?! Insulting those with autism…just ick. What a shameful way to promote your agenda… The Canary Party’s decision to photo shop this image in particular trivializes the real danger and terror that these young Nigerian girls are going through right now. You can go to the Canary Party Facebook page and see that, yes, there are some comments supporting the picture. And, in some strange irony, advertisements for faux autism cures. Somehow this is a business opportunity for someone to put his wares in front of autism parents. But most of the comments are very critical of this photoshopped picture. Let’s go through the faux autism advocate message. Let’s call the 1.2M autistics an epidemic. A crisis. That’s what they want. Not help. Not support for autistics. Labels. Consider this: they’ve been calling autism an epidemic and a crisis for many years. When has it ever helped? Consider that number: 1.2 million autistics. There’s heavy irony in them using that number. 1.2M is based on an estimate of the number of autistic children in the US based on the recent CDC autism prevalence report. Somehow adults just don’t count to whoever did that photoshop. Also, 1.2M is an estimate assuming that the prevalence is flat among all children. Think about that. 1.2M is a number that basically assumes no epidemic in the past roughly 20 years. This is an example of why I don’t consider these group and these individuals to be autism advocates but faux autism advocates. They are not helping. They are in the way. Right now the estimate is that there are 1.2 million autistic children in the U.S.. The real number is almost certainly higher. And there are many more adults. When have these supposed autism advocates called for a real count of autistic adults in this country? The answer is that they haven’t. Such a count would likely give more data to counter their message of a vaccine induced epidemic. Ironically it would move us closer to actually determining if there is a real rise in the fraction of our population who are autistic. It would be a big step forward in understanding the needs of autistic adults. It would be a step towards learning what helped some autistics gain independence or greater independence. And what may have held some back. There’s so much we could learn. So much that frankly could help my kid. But instead we have people crying out for acknowledgement of their failed opinions, not real steps forward. I disagree with the idea of photoshopping an image to publicize autism awareness. The First Lady was drawing attention to a terrorist group that was kidnapping children and selling them into slavery. Autism is not an analogy to slavery. Autistic children are not “missing”, or kidnapped, they are “disabled”. Of course, some of the criticism is misplaced as well. The sign they photoshopped was actually talking about children in specific, so the 1.2 million figure is actually more correct in this circumstance than it would be if they included the figure for adults. The sign did not mention vaccines, and did not mention injury by environmental factors. Even though someone might believe those things, that is a discussion unrelated to the photoshop. Their opinions (in this case) are a separate issue from the action they use to draw attention to themselves. Finally, I disagree with the statement that anyone who calls autism “an epidemic” must “hate autistic people”. That is a non-sequitur. Just because someone compares autism to an infectious epidemic does not mean their analogy is based on hatred. I agree with your point that America should be spending more time and effort trying to meet the needs of autistic adults, but I disagree that talking about children is standing “in the way” of progress. Children are a natural concern of society. The general public is more aware of the needs of children, because of the assumption that they are less able to fend for themselves. This is particularly true in the case of autism, because research has shown that earlier intervention tends to produce better results. Many parents tend to advocate mostly for early intervention. It is not fair to say that these parents are opposed to treatment programs for adults. They simply have a different set of priorities. That’s what I’ve seen with this image online. The first that was sent to me had some tagline like “I vaccinated my kids into autism”. So perhaps I brought my experience to the article without the appropriate links. I don’t know where you got the idea that I think that talking about children is standing in the way of progress. I didn’t say that talking about children is standing in the way of progress. Didn’t even imply it. The parent groups pushing this image are standing in the way of progress. They’ve thrown over a decade of effort away. One way that they have stood in the way of progress is by claiming that there is an epidemic and refusing to support efforts to focus attention on adults. Time and again I’ve seen people from these groups online claiming that only one type of study would be useful. I’ve asked them time and again to show me where they and their orgs have supported research into something as simple as autism prevalence in the adult population. I’ve asked them whether they would support such an effort. They ALWAYS walk away from that discussion. Always. True. Parents of the young. At some point many parents start also advocating for the needs of adolescents and adults. I can’t say as I’ve seen a lot of advocacy for early intervention from groups like the Canary Party or others represented by the blog AoA. Of course, the Canary Party seems to be failing fast, and AoA has lost a lot of it’s standing in the discussion since they lost Jenny McCarthy and Jim Carrey’s input. Agreed. Some of the reason that the public is more aware of the needs of children is that we as a community don’t spend so much time framing the message as being about all autistics. I didn’t say that they are opposed to supports for adults. They fail to focus attention on adults and because of their adherence to the failed vaccine epidemic theory refuse to support advocacy for adults. I think the Age of Autism blog is slowly realizing that they should focus some attention on adults. Perhaps I’ve missed it–where does the Canary Party stand on focusing research priorities on supporting adults? SafeMinds? Generation Rescue? I could go on. Comparing us to a disease isn’t exactly pro-autism, to consider us an epidemic is to consider us a negative within society that needs to be stopped, something that is viewed as harmful to our communities. I understand what you are saying. Disability should not be compared to disease, even when talking about prevalence. There are plenty of other words to choose from. I was mostly disagreeing with the comment that Matt quoted: “This to me appears that you HATE autistic people”. It appears to me that they are accidentally using an offensive word. That is different from hate. When you assume that you know the motives and emotions of other people, you are making (more or less) the same mistake they are. They assume that the word is a useful tool for spurring people to action. They assume your feelings are less important than the action they desire. You assume they are uncaring. In both cases, it is the assumption that should be challenged, not the emotion. The other day, I was speaking to a friend about the number of children with autism. I told him it was “more than the population of Dallas.” I felt like that was a better analogy than comparing it to a disease. I quoted that as an example of how negative the reaction is to this picture. Note that the person quoted says “It appears to me that…” The author isn’t claiming to know the motives and emotions of anyone else but is describing what how the actions appear to present the emotions of the person who made the picture. I would hope you would then go on to point out that the adult autistic population in the US is almost certainly even greater. I assume that your friend and you understood that you were limiting yourself to the US. The number of autistic children in the world is likely about 25 million (assuming 2% of about 2 billion children). I point this out because people all too often consider autism to be about children and about the U.S..
“I was mostly disagreeing with the comment that Matt quoted: “This to me appears that you HATE autistic people”. It appears to me that they are accidentally using an offensive word. That is different from hate. Have you forgotten futuredave5, that The Canary Party is the political arm of Age of Autism? Have you forgotten futuredave5, that the founders of that Party (which is not registered as a political party), are all associated with Age of Autism…as well as the current officers and their regional representatives? Surely, you haven’t forgotten that Age of Autism’s “journalists” refer to the prevalence of ASDs as “a holocaust” and as “a tsunami”. The commenters on AoA also refer to their autistic children as “stolen”, “lost”, “train wrecks” and other vile dehumanizing expressions. I don’t know about how you refer to your special needs child, but I am incensed that any child is referred to as stolen, lost, and train wrecks.